Replace "#browser-bottombox" with "#main-window" in your code. Horizontal scrollbars will reappear and text/link popup will not overlap with navigation toolbar anymore. Sorry if that has been asked before, but this thread is a little to long tpo search for this. Is there a version for this for a "TV Box" (aka; "Streaming Box)? Specifically using a Zidoo X10 running Kodi (since just about all seem to have that). Same goes fro TabMix Plus. CTR is for the desktop version of the "old" Firefox and its forks only. Streaming boxes use "Firefox for Android" which is not and never was compatible to ui changing add-on. Aris, thank you very much for your help! I have changed the code like below as you suggested but it does not work this time. Maybe I should just move the nav-bar back to top. Thanks for your time again. Thanks, I should of known better. I think I have a minor bug with CTR. Firefox 52.8 ESR, Windows 7. When I type enough characters in the location bar to uniquely match one bookmark, then the result is not displayed. It is actually there, though; if I press the down arrow, then the bookmarked URL appears in the location bar. - enabled "Remove 'Search with' and 'Visit'"
- enabled "Disable height limit"
I will get it if this is not worth fixing at this point. I can work around it by disabling "Alternative appearance". Unfortunately this bug is present since I have added the "Remove 'Search with' and 'Visit'" option. It does not remove the entry technically only visually. OK, thanks for the info. I'd rather give up Alternative appearance than Remove Search with... so that is solved. 1) The classic Firefox menu button (the one which looks like the Firefox logo and replaces the hamburger button) is pixelated / low resolution on High DPI screens. I use a MacBook Pro Retina, so extremely High DPI for a laptop. No other CTR button is pixelated, strangely enough. I hope this gets fixed. 2) In this very same classic Firefox menu button, it shows "Quit Firefox" even when a language pack is used, i.e. the entry is the only one not localized. 3) When using Waterfox, it shows "Quit Firefox"... It should show "Waterfox" in this case. Haven't tested if that's the case with Basilisk, too. 4) I remember you fixing the add-on for Basilisk some time ago, are you sure the fix still applies? Because Basilisk has gone back to Firefox 52 as a base, and I remember said fix targeting a higher Firefox version as base. That's all. Thanks for creating this great add-on. 1. I never bothered with hires icons for the appbutton. The other buttons use default browser icons, so they are hires by default. I will look into this, but no promises atm. 2./3. If "Quit Firefox" is shown instead of the default localized item, this means either the localization variable name changed or the variable was removed. I don't see similar behavior on Windows for example. I will look into this. 4. This was a different case. There was a bug with classic/alternative autocomlete popup which had to be fixed by cheating with internal application versions. I will look into these issues, but no promises atm. Aris wrote: 1. I never bothered with hires icons for the appbutton. The other buttons use default browser icons, so they are hires by default. I will look into this, but no promises atm. There are many icons in CTR, that were not meant for HiDPI usage and I'm not going to update all of them. On recent devbuilds I only replaced the white appbutton icon for HiDPI modes above 110%. 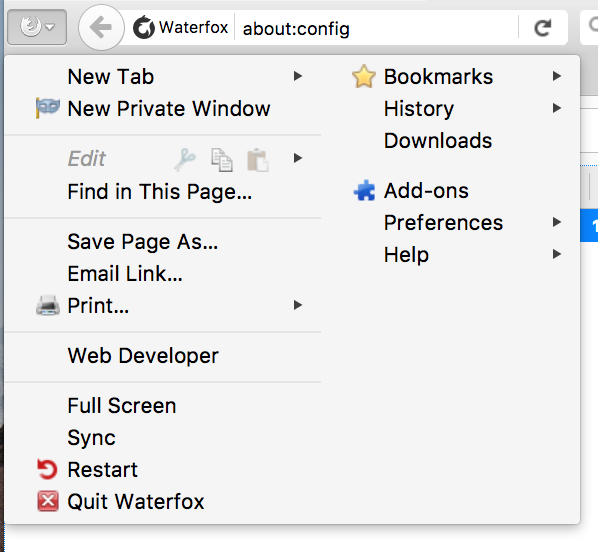 "Quit Firefox" is now "@Quit Waterfox" in Waterfox. I haven't tested Firefox 52-56 or other locales yet, but I assume the correct label gets automatically used there too. @Aris are you still gonna submit new releases to AMO? or should I install your latest from GitHub? If you use Waterfox, you can install updates from Github. You will even get auto updates from there. The 1.7.4.x builds are test atm, so they have to be installed manually. yeah I upgraded my main Install of Firefox to release channel again v60 so I could keep an eye on it..
as far as If I install your test build will I still get a new update automatically from you still? btw.. do you have a change log for build v1.7.4.1 and v1.7.4.2 yet? ?